You know how sometimes when you pay so much for a particular makeup product but it just doesn’t work for you? I’m sure we all encountered that at least once in our lives and it is very frustrating, I know! For me, a good example would be the Urban Decay 24/7 Glide On Pencils. It NEVER works for me and it smudges the next hour after application. Well, let me introduce you to a Taiwanese brand, Solone, affordable yet full of quality products! 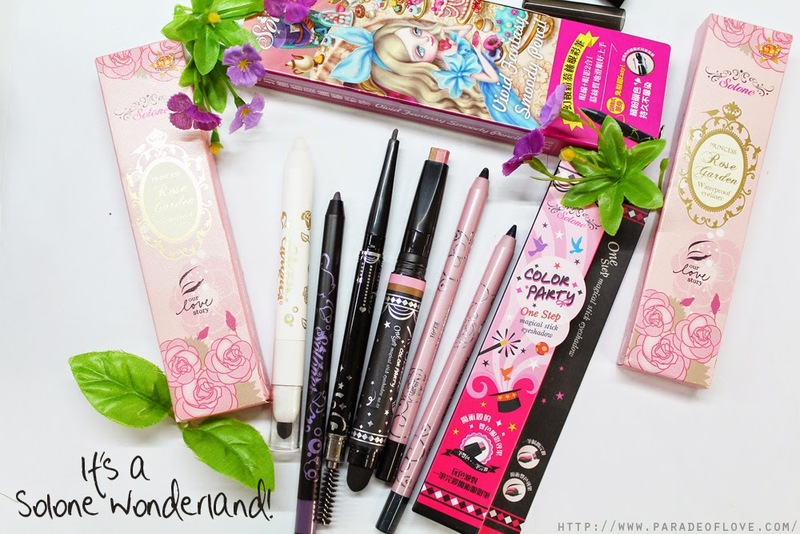 I am in love, especially with the eyeliner pencils! They stayed with me for a good 8-hours without budging, I’m impressed! 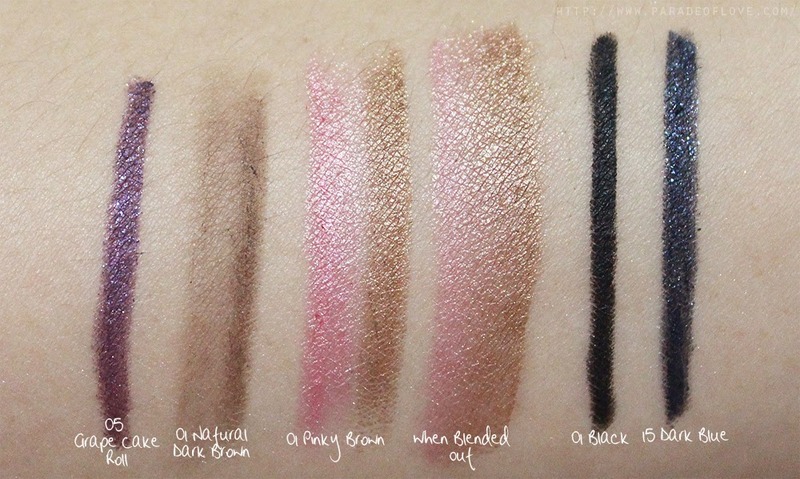 I had been given a chance to try out the Rose Covering Makeup Remover Pencil, the Vivid Fantasy Smoody Pencil, Color Party One Step Magic Eyebrow Pencil and Magical Stick Eyeshadow and the Rose Garden Gel Eyeliners c/o Solone Singapore (the names are so long, pardon the hard-to-read sentence)! I first chanced upon Solone when I was walking by SaSa one day because a promotional rack caught my eye. It was the Flight of Fantasy series that Solone newly came up with, covering an eyeshadow kit with optional blushers, powder foundations and eyeshadow colours that you can mix-and-match (I will link the review here once it is up). That sparked my interest in this brand because upon swatching, the eyeshadow were so pigmented and blendable that they surprised me! Being told by the Solone team that these products are comparable to brands like MAC etc., I had to give it a go. 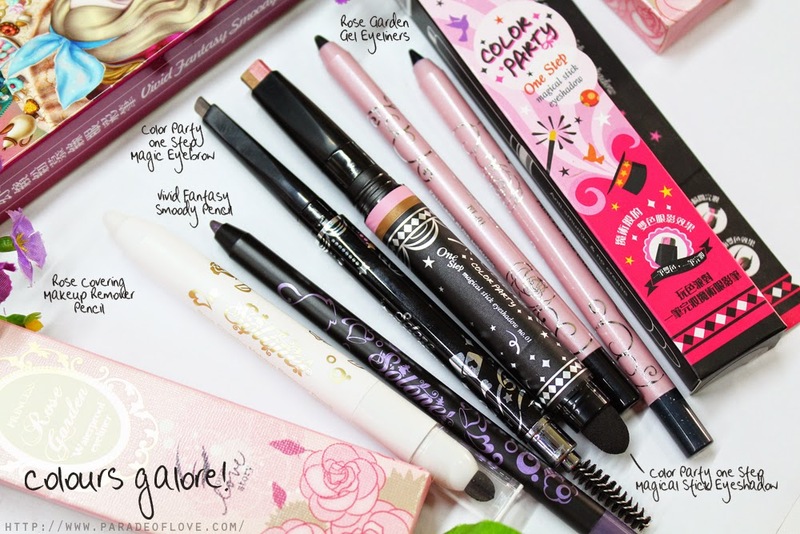 If there is one thing you have to grab from this brand, it has to be the Gel Eyeliner Pencil! The Gel Eyeliner Pencil is second to the Shu Uemura Drawing Pencils in terms of staying power on my oily lids and I would say it’s comparable to my Maybelline Lasting Gel Eyeliner. As with usual gel liners in a pen, these are easy to apply and I picked a matte black (01 Black) to pair with a more vibrant dark blue shade (15 Dark Blue). These are the usual colours I wear for my eyeliners. In terms of holding power, these lasted me for a good 8 hours and only started to smudge a little at the corners of my eyes. However for the Smoody Pencil (05 Grape Cake Roll), it lasted me for about 6-8 hours of wear and I usually pop this metallic purple eyeliner on my lower lash line to brighten up my eye makeup. I find that if you pat in an eyeshadow, it can last slightly longer. Moving on to the more interesting products – the ones with 2 tones – the Color Party One Step Magic Eyebrow Pencil and Magical Stick Eyeshadow. As for the eyebrow pencil, I didn’t quite like the 2-tone effect it gave on my brows but the best part about the brow pencil is none other than the spooly on the other end! YES, THE SPOOLY. I have a thing for eyebrow pencils with spoolys (is that how you spell it?) because combing through my brows after filling it just makes them look more even and natural. The spooly in this pencil is the softest I have came across and very functional as well – something that you’d just throw into your makeup bag! 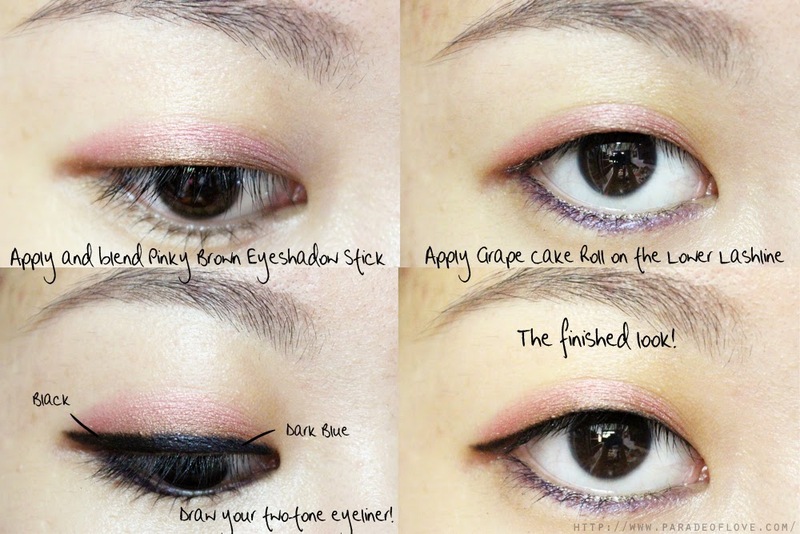 The Magical Stick Eyeshadow (01 Pinky Brown) is yet another product that allows you to do a quick and fuss-free eye makeup, very much for people who do not have the luxury of time in the morning. It has 2 shades (a lighter and a darker, defining shade) that comes in a stick form for you to glide onto your lids. The sponge tip at the end serves to blend the 2 shades together to remove any harsh lines. It’s that easy! With an eye primer, these lasted the entire day and I would say if you are constantly pressed for time, just get one and it’ll settle all your morning-makeup woes indefinitely! And on to the last product, which is the Rose Covering Makeup Remover Pencil, something that most brands do not seem to carry. If you are someone who always make mistakes in your makeup application, especially drawing your winged liner (I know, I have troubles even until now! ), this is going to be your best friend. Simply use the white crayon tip to draw over your mistake, and “erase” it with the sponge tip on the other end! It removes even my Maybelline Lasting Gel Eyeliner! But of course, don’t let your makeup set for a period of time before you try this because it’s not going to be as effective. Swatches to show you the vibrancy of the shades. I could stare at the sparkles in Grape Cake Roll and Dark Blue eyeliners all day. Overall, there were so many fun colours for me to play around and I can even do a complete eye makeup look with all these products! Very easy! Here is my eye makeup creation from all these products (except the Makeup Corrector). I have been playing around with the 2-tone eyeliner technique and very much loving it! I even got compliments wearing a purple paired with a matte black! Did they change their packaging? 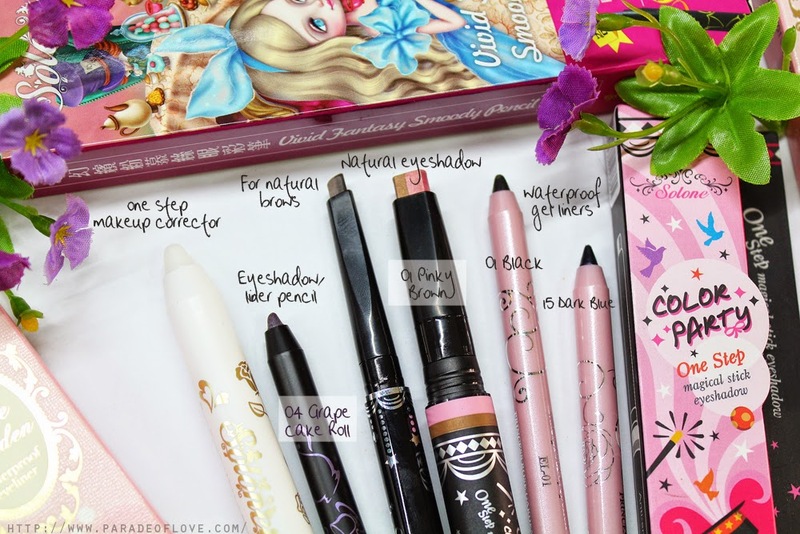 I have one Salone eyeliner in Black but the pencil itself is BLACK, not pink like yours! And yes these are long-lasting! Most pencil eyeliners smudge on me within a few hours and this one held up pretty well. It did smudge a TINY BIT but I love it enough to keep using! Great review! 🙂 I might go try out the eyeshadow stick cause it looks fun! Hello Sharmain!! Oh gosh I didn't expect anyone to be commenting here but thank you for visiting! 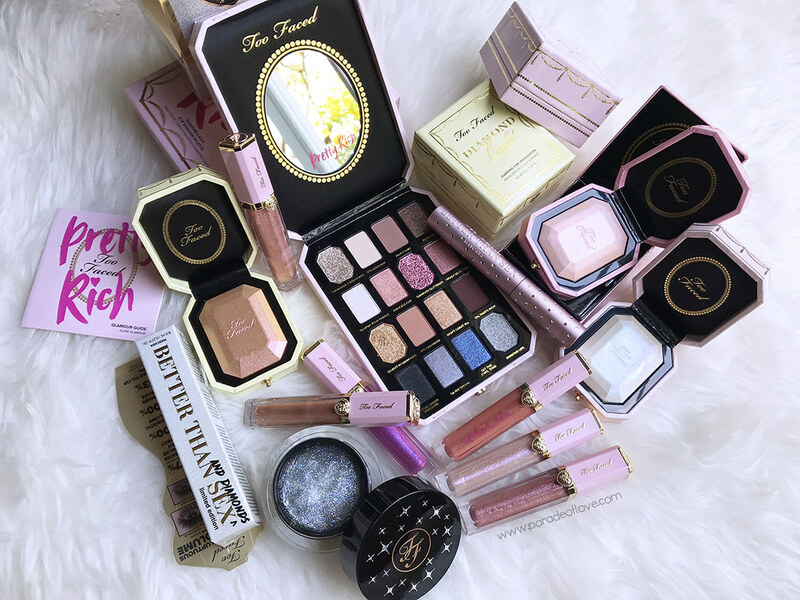 Yes, they have different packaging because they have different series like the Alice Fantasy Adventure ones and Rose Garden series but essentially, the gel eyeliners in both collections are the same thing! Yes it did smudge on me a tiny bit after around 8 hours as well. If you are looking for a completely budge-proof one, try Shu Uemura's Drawing Pencils! They still amaze me till now!